Age gap romance, what's the deal? Dramas about romance between people with a big age gap are in. tvN "Rude Miss Young-Ae Season 13", JTBC "Secret Love Affair" and others have been appearing with different types of age-gap couples. It's becoming a trend for the male characters to be younger than the women these days. -A single lady and a younger man's fling "Rude Miss Young-Ae Season 13"
tvN "Rude Miss Young-Ae Season 13" is all about the romance between single lady Yeong-ae (Kim Hyun-sook) and younger man Ki-woong (Han Ki-woong). He is 9 years younger than her but takes care of her. He's like a ray of light that cheers her up when she is exhausted from work and life. He's cute in the way he just randomly suggests getting married. He isn't afraid to show his feelings for her and is passionate in his role as the younger guy. -A steady shoulder to rely on "A Witch's Love"
A new age-gap couple has arrived and that's Ban Ji-yeon (Uhm Jung-hwa) and her younger man Yoon Dong-ha (Park Seo-joon) in the tvN drama "A Witch's Love". He is 14 years younger than her but their circle of love starts when she's staking out for a news report and he chases her about. Cute Dong-ha is more like the dependable guy she likes to rely on. He's already attracted several female fans in the first few episodes. Who knows what will happen between the golden miss and red-blooded youth? 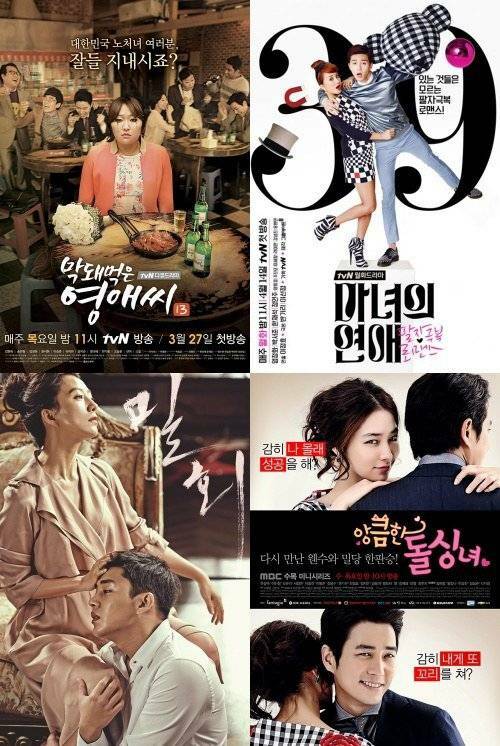 -Forbidden love and passion"Secret Love Affair"
JTBC "Secret Love Affair" talks about an age-gap couple of 20 years. Oh Hye-won (Kim Hee-ae) falls madly in love with Seon-jae (Yoo Ah-in) who isn't afraid to show his passion for her. She's always been about morals and ethics but she feels her desire for him. Their forbidden but uncontrollable love can be seen every Monday and Tuesday at 9:45PM. There's another age-gap couple in the MBC drama "Sly and Single Again". Sook Seung-hyeon (Seo Kang-joon) is a playful youth who is also the heir to a fortune. He isn't afraid to be honest and ask questions like, "Do you like me?" He brings out the soft person in Na Ae-ra (Lee Min-jung) but sometimes surprises her with his masculine appeal. Romance between an older woman and a younger man has become a trend and is being accepted differently now. They seem to be appealed by the fact that younger men can be soft and cute and manly at the same time. "Age gap romance, what's the deal?" Choi Jin-hyuk, "I'll be gone to the army after one more project"